For evangelicals who lament last Friday’s Supreme Court decision, it’s been a hard few days. We aren’t asking for emotional pity, nor do I suspect many people are eager to give us any. Our pain is not sacred. Making legal and theological decisions based on what makes people feel better is part of what got us into this mess in the first place. Nevertheless, it still hurts. There are many reasons for our lamentation, from fear that religious liberties will be taken away to worries about social ostracism and cultural marginalization. But of all the things that grieve us, perhaps what’s been most difficult is seeing some of our friends, some of our family members, and some of the folks we’ve sat next to in church giving their hearty “Amen” to a practice we still think is a sin and a decision we think is bad for our country. It’s one thing for the whole nation to throw a party we can’t in good conscience attend. It’s quite another to look around for friendly faces to remind us we’re not alone and then find that they are out there jamming on the dance floor. We thought the rainbow was God’s sign (Gen. 9:8-17). If you consider yourself a Bible-believing Christian, a follower of Jesus whose chief aim is to glorify God and enjoy him forever, there are important questions I hope you will consider before picking up your flag and cheering on the sexual revolution. These questions aren’t meant to be snarky or merely rhetorical. 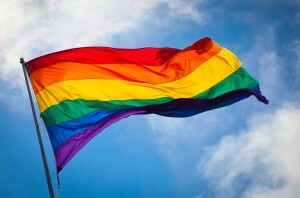 They are sincere, if pointed, questions that I hope will cause my brothers and sisters with the new rainbow themed avatars to slow down and think about the flag you’re flying. 9. Do you believe that passages like 1 Corinthians 6:9 and Revelation 21:8 teach that sexual immorality can keep you out of heaven? Food for thought, I hope. At the very least, something to chew on before swallowing everything the world and Facebook put on our plate. Note: An earlier version of this post had the questions in paragraph format rather than enumerated. The content is still the same. Readers interested in studying what the Bible teaches about homosexuality may be interested in checking out my new book on that theme.